On Saturday 19, I'm participating to a panel on Hallyu and Ethics at Korea University for the First Congress of the World Association for Hallyu Studies. 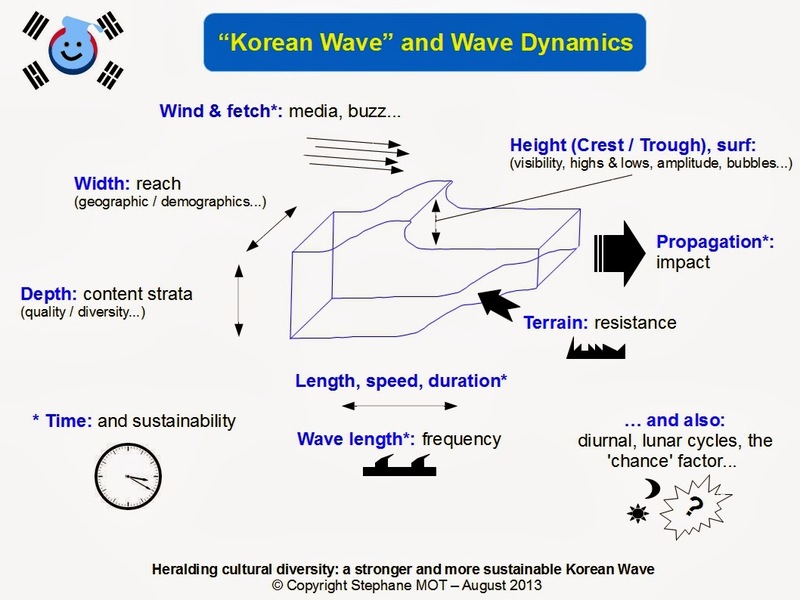 My paper is titled "Heralding cultural diversity - a stronger and more sustainable Korean wave", and you can peek at the summary and menu below (bonus: you get an image because you're so kind!). 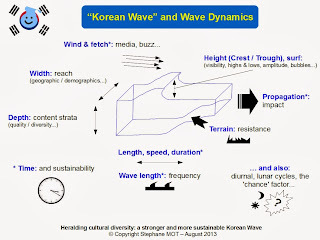 Of course I barely scratched the surface of the vast and diverse ocean of Korean culture* but that was the point: Hallyu won't go far if it defines itself as a wave; waves are only means, elements of proof that this ocean is vast, diverse, and alive. And culture is not just about cultural contents but also about how people live, use time and space, not just about cultural sectors but about society at large. So yes, good or bad urbanism or business practices also impact the way Korean culture is perceived: typically, Korea cannot herald creativity and diversity overseas if its urbanism negates them at home, and cases of abusive contracts and working conditions in K-pop industry exposed by Western journalists who came to investigate the phenomenon in Korea hurt much more than the classic criticisms denouncing a 'culture industry'. This year's agreement on a standard labor contract across the movie industry to end a long tradition of film crew exploitation marks an excellent trend, and my piece is optimistic because going ethic is not only the only option, but good business. Learning from nature and wave dynamics: waves are a bit like the tip of the iceberg, except everything is moving (moving as in 'movement' and 'emotions', with an infinite variety of facets and paces). Note the vocabulary similarities with marketing campaigns, which also often come in waves. "Korea can fulfill its potential as a cultural leader, become a positive role model, and ensure durable success beyond short-lived fads. And because true leaders cannot be respected if they are not respectful, this cannot happen without understanding how wave dynamics work in nature, without a resolute ethical and sustainable approach of the ecosystem at home and abroad, and without embracing cultural diversity. Making more room for smaller players and indie creations, developing fairer revenue sharing models will not only ensure sustainability and benefit all players, but also help raise the nation’s image overseas."